Spring is here. Have you made a list of chores to do inside your home? It’s no secret that early Spring is the best time to declutter, improve and bring forth a new thing – whether on home aesthetics or functionality. While this season is ideal for intensive house cleaning, the 2017 Choosi Clutter Report found out that 1 out of 3 Australians make efforts to declutter our home during Spring. The same data company states that $59.36 billion of clutter or unused possessions are kept in the majority of Aussie households. 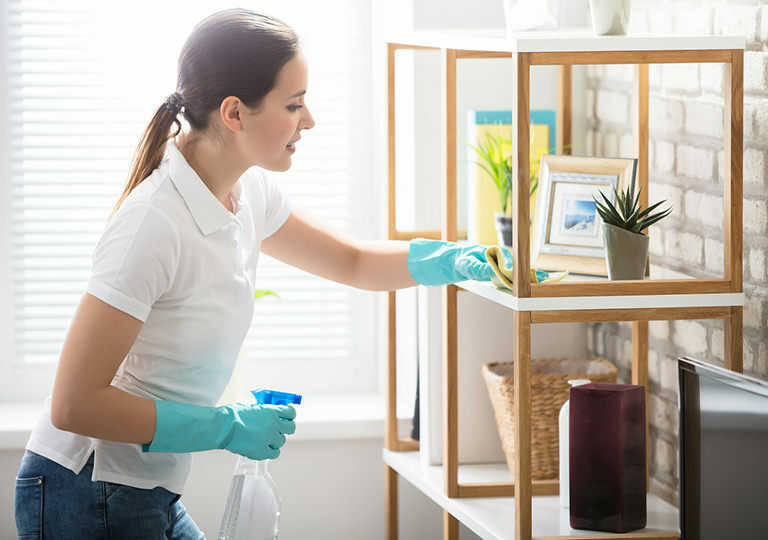 Taking time to spring clean lets you attend to specific areas such as the bathroom, kitchen, living room, laundry area and other parts of the house. Rarely disturbed areas like cabinets and closets also deserve the best of your attention. Checklists serve as your tangible reminders. Creating a detailed plan for house cleaning is a huge help in determining what requires urgent maintenance, repairs or replacement. You also get to prioritise the most important tasks such as cleaning those high-traffic areas around your home and move into the least significant ones afterwards. Whether it’s a cupboard, fixture or any piece of furniture, it can be ideal to list down the items that you need to save and dispose. Identifying the necessary tools and materials for house cleaning is easy as long as you have planned what you need to accomplish. Microfibre cloths, mops and squeegees are some of the must-have cleaning supplies that you need to meet your objectives. Others include cleaners and sanitisers to remove any hardened food stains and deep-seated dirt from surfaces. Preparation lets you distribute the tasks evenly before starting out. This includes managing your time and focusing on most areas that require deep cleaning. Will you be working first on the living room before the kitchen area? Establishing a working schedule can be beneficial especially if you have other tasks to complete within a limited time period. Are you looking to have it done on a daily or weekly basis? Setting a new timeline can help you get back on track when something urgent comes up. Listening to music when working contributes to increasing someone’s productivity according to research. While motivational music can make you feel more energised while cleaning, you can have the freedom to choose what type of music to play to help you get your tasks done quickly and effectively. Whether you prefer to listen to instrumental or lyrical music, it’s good to discover what works for you better and check how you respond. Not only can it help in boosting your energy but also manage your speed as well as your quality when it comes to house cleaning. Don’t wait until your house become a den of rubbish. Before commencing the work, make sure to hire a skip bin service to properly manage all the rubbish found around your home. Doing so will help protect your family and your neighbourhood from health problems caused by waste products and chemicals. You can also contribute to saving the environment if you commit to store your rubbish in one place and have them transported to licensed sorting facilities. It can be tempting to wait for days or weeks before you start doing your spring cleaning chores. If you have enough strength and resources to do the job, it’s better to complete the task within a short span of time than doing repetitive delays. Letting go a few of your dearest possessions can be hard, but keeping them forever may not be ideal especially if they consume large amounts of space in your house. Holding onto sentimental items that add clutter to your home may cause significant impact not only on your health but also on the environment and your property value. Ready for the Actual Spring Clean? House cleaning doesn’t have to be a burden. With proper preparation and scheduling, you can achieve a cleaner and more appealing home in the coming months. Looking for the best house cleaning service in your area? You can always get help from your local house cleaners to give you an extra hand. Getting help from your family is also one way to increase your productivity. Make your home spring-ready with these easy-to-remember tips!